All transactions are safe and secure with a reliable history in online purchasing behind each of our associates. 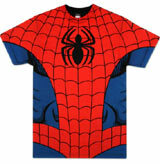 Buy the Spider-Man Costume t-shirt to own Spider-Man clothing and merchandise. The Spider-Man costume t-shirt on the left is an officially licensed Marvel product that can help to bring your dreams of being a web slinger to life. The red, blue, and black design covers the tee, displaying the torso of the superhero's costume. The familiar black Spidey symbol is visible on the chest, overtop a black web-like design. Add this to your collection of Spider-Man t-shirts and clothes. In addition to the Spider-Man Costume tee above, browse the Spider-Man Clothing Gallery for more apparel like men's and women's clothes, kids shirts or hoodies.